On Tuesday evening November 6, Election Night, the Town Council Chamber at Fairview Town Hall was filled to near capacity. It had nothing to do with the Mid-term elections. It was all about Fairview’s Fire Station No. 1, a hodgepodge of ramshackle structures, including one that became un-inhabitable and was replaced this week by a leased temporary structure, that has deteriorated so seriously that it is in dire need of replacement. It was on November 6, 2017 that Fairview residents resoundingly rejected a $25 million+ bond proposal to construct town administration facilities, including a new fire station No.1. The Fairview Town Council was so taken by surprise by the defeat and at the margin of the defeat, 70% opposed the proposal, most citing its lavish cost. In the months that followed the Council seemed unable to respond decisively. One of the outcomes, however, was the appointment in January 2018 of a Community Resource Group (CRG) composed of 57 residents recommended to the Council by a network of Fairview homeowners associations. The CRG was charged with developing strategic plans for the continued evolution of Fairview from a small rural village to one of Collin County’s most dynamic communities. The CRG met several times in the months since, with and without the presence of the Town Council. It distributed a survey to residents probing the reasons for the fiasco of the November 2017 bond election. While voters rejected the bond proposal decisively, 89% of respondents to the survey support the building of a new fire station No.1. Concurrent with the work of the CRG, the Town Council tasked the Town Manager, Julie Couch, to determine how other fire departments are meeting their service goals with limited funding. Couch and her staff talked with fire departments in Ft. Worth, Plano, Wylie, Frisco, and Murphy. Couch discovered that all had bought lower-cost utility vehicles, called squads, outfitted to respond to medical and other non-life-threatening incidents while sparing the use of and wear and tear on the larger and far more expensive firefighting apparatus. A fire truck fully outfitted can cost $1,000,000, whereas these smaller vehicles range in cost from $200,000 to $300,000. Ironically though, a lack of firefighters in most of these communities is keeping some of these squads garaged for now. Couch’s conclusions are that Fairview needs to conduct a cost benefit analysis of the concept and that the design of a new fire station No. 1 would not be impacted by the acquisition of a squad unit. Several times during the discussion mention was made of the new Desoto fire station that cost $6,500,000. Councilmember Tony Mattei observed that, “Compared to our current plan at $10,000,000 it looks like we might be able to save $3,500,000 by carefully scrutinizing the Desoto plan”. Other members, including residents in the audience agreed. Mayor Culbertson outlined a proposed motion to council members that would finalize the designed of fire station No.1 on or before February 20 so that a new proposal could be placed on the May 2019 ballot. As part of this renewed effort, the council would engage with the CRG to explore funding options, including ways in which to bring the new station on line perhaps, without raising Fairview property taxes. It was also suggested that the town bring in a third- party consultant to review the design of a new station on behalf of the council. The motion was unanimously adopted resulting in enthusiastic applause from the audience. 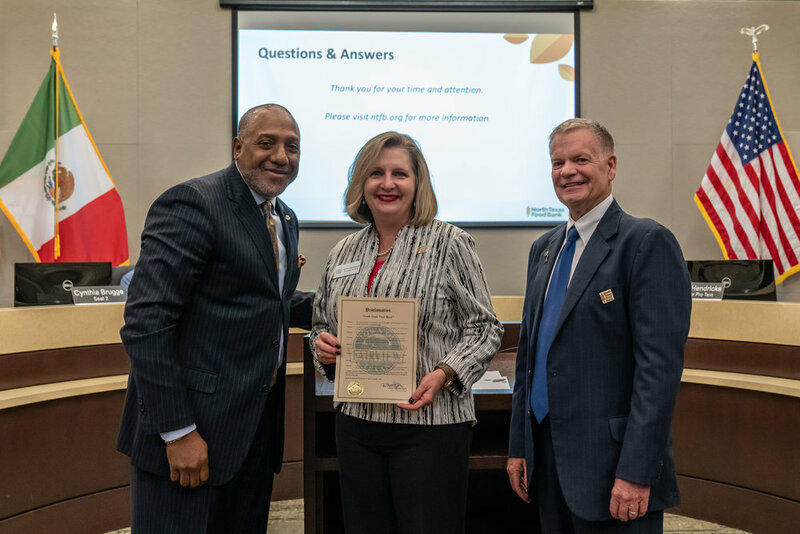 In other matters before the council, Mayor Culbertson presented a proclamation declaring the week of November 10 to 18 as Homelessness Awareness Week in Fairview to Trisha Cunningham, President and Chief Executive Officer of the North Texas Food Bank and William Carnegie of the NTFB board. Carnegie shared distressing data with the council about hunger in Collin County. Carnegie disclosed that 800,000 people in the Food Bank’s 13-county area are hunger challenged including 5,750 people in Collin County and 400 people in Fairview, including a significant number of veterans. The food bank currently provides 190,000 meals daily and has a goal to provide 92 million meals by 2025. Culbertson also presented an Arbor Day Proclamation declaring Fairview’s commitment to preserving its trees and natural beauty. The next meeting of the Fairview Town Council takes place on Tuesday, December 4 at Town Hall. Mayor Darion Culbertson (L), presents Trisha Cunningham, CEO, North Texas Food Bank and William Carnegie, NTFB Board (R) with proclamation declaring November 8-16 Hunger and Homeless Awareness Week Fairview.